Jetpack is the solution to the situation everyone has been in at some point in their life, when you need something but don’t want to buy a whole package, or you need it right away and don’t have time to go get it yourself. 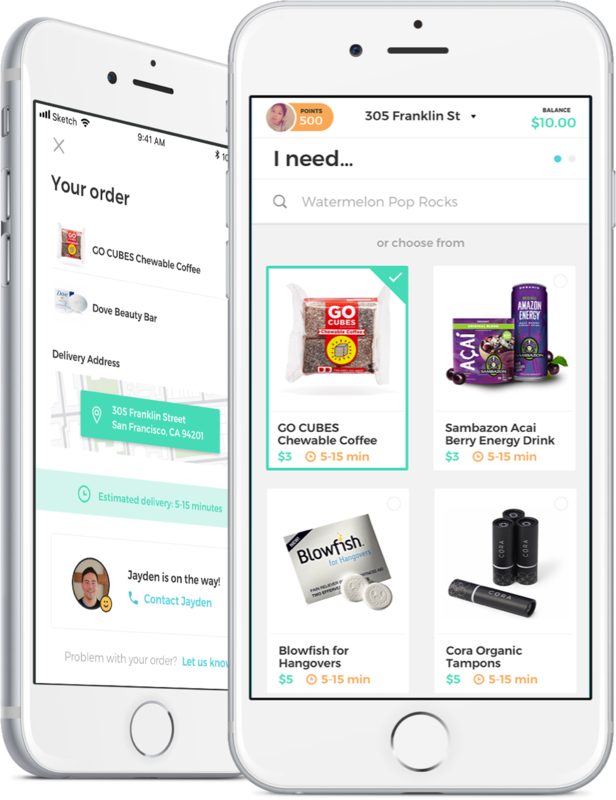 Jetpack teamed up with Yeti to build a new mobile app experience that could support the startup's growth from an on-demand delivery service into an on-campus marketplace that could scale into other campuses. Jetpack has been saving students’ day delivering essential items across the Stanford campus by stocking Jetpackers with products. While this model allowed them to boast a 15 minute or less delivery time and affordable prices, Jetpack was ready to reposition itself and scale up as a peer to peer marketplace where anyone can help anyone get the item they need. Jetpack saw an opportunity in how students were using dorm-based email listers to request things they needed from neighbors, anything from a tablespoon of cooking oil to outdoor tiki torches for a party. Our design and technical challenge was to create a new version of the product inspired by and combining these communities of goodwill and Jetpack's brand promise of speedy delivery. How do we create a safe, trustworthy platform that encourages users to fulfill requests, while keeping multiple orders, sellers, and buyers in sync with each other at all times? Yeti designed and developed a mobile app that facilitates real-time delivery and order status updates to create a seamless experience for both the requester and fulfiller. Encouraging quick engagement in the marketplace is vitally important to the health of the marketplace and success of the system. First time users breeze through the onboarding flow, signing up with just their phone number and are welcomed to the marketplace with a $10 credit in their Jetpack balance to be used towards their first purchase. Buyers can search for anything they need. If Jetpack doesn’t have it, they can create a request that pings nearby users to be fulfilled. To encourage quick responses to these time-sensitive needs, requests are open for only 30 minutes, and sellers earn more reward points the sooner they fulfill the order. Since trust was an influential factor in user’s likelihood to participate in the marketplace, a friendly rating system for both sellers and buyers is baked into the experience to help add a human touch to user’s avatars. To maintain a fast-moving double sided marketplace, it was extremely important to make sure that we were able to keep sellers and buyers in sync with each other with the latest order status updates. We leverage the power of React Native, Websockets, and Notifications to make sure that the buyer and seller are seeing the most up to date data and know what’s the next step in their order. There is also a payment solution utilizing Stripe, an account balance and a points system for rewards. As a young startup, Jetpack also looked to Yeti to set them up for future success in growing and scaling their business, application, and product development team. We provided a full service design and development team to act as a partner and interim executive team to create the highest quality, long-term software product. The Jetpack development team joined our sprints and worked out of our offices in San Francisco. Their team has continued to use Yeti’s Applied Agile development process. Working with Yeti was a game changer for us. They helped us gather valuable insights from our users and worked with us to distill them into a stellar product. On top of that, they went the extra mile to mentor our development team and help us improve our agile process. We’re still reaping the benefits of working with Yeti months after our work with them has ended. The Jetpack - Instant Delivery application just launched! Hundreds of requests and deliveries are currently being made on the campuses at Stanford and John Hopkins University. More campuses are coming soon. Stay tuned for future updates and you can find the application on iOS and Android.